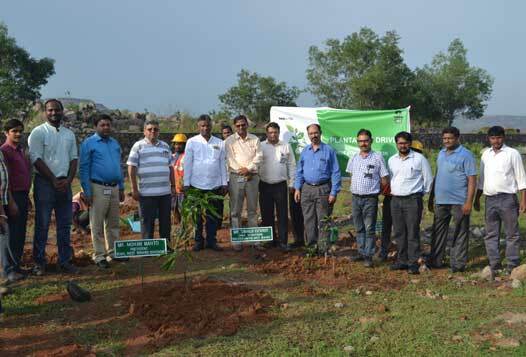 West Bokaro: In line with its fundamental principle of respecting and safeguarding the environment, Tata Steel’s West Bokaro Division has planned to plant 50, 000 saplings in and around its areas of operation in this fiscal year. The plantation drive was officially launched today at Pundi area of West Bokaro under Mandu block of Ramgarh district. The event was graced by Mr Sahabji Kuchroo, Chief Operations, Tata Steel (West Bokaro) as Chief Guest who launched the plantation drive by planting a sapling in the presence of Mr Mohan Mahto, President, Rastriya Colliery Mazdoor Sangh (RCMS), Mr Praveen Sinha, Chief, HRM, Tata Steel (West Bokaro), Mr Mayank Shekhar, Chief, Quarry AB, Tata Steel (West Bokaro), Mr Sanjay Kumar, Head, Operations, Quarry AB, Tata Steel (West Bokaro) and Mr Keshav Ranjan, Unit Head, Tata Steel Rural Development Society (TSRDS). Apart from developing a green cover in the area, this drive will also support five Self Help Groups of the region from whom 30, 000 saplings worth Rs 2.5 lakh have been procured. The remaining 20, 000 saplings are being procured from the Forest Department, Ramgarh. As part of the plantation drive organized by the West Bokaro Division last year, 75, 000 saplings were planted.